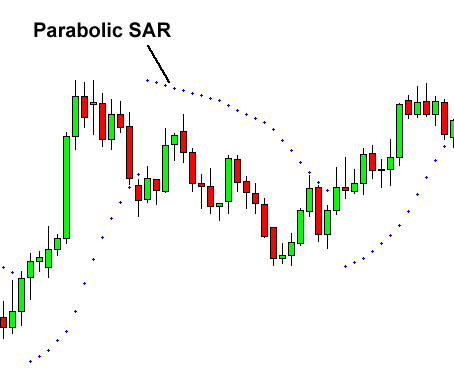 As we know that many kinds of indicators in forex trading, which draw from the parabolic SAR is located on the ease of use (easily seen) from the above brief description by no means a simple look .. In addition, this indicator has another feature that is in the show during the reversal (end) of a trend. In the picture below shows how parabolic SAR to help give the trend reversal signal. When a new point appears above the mean trend of next is bearish (down), to be sure wait until form 3 points above. And in the next example, a new point appears below the price, meaning the next trend is bullish (rising). 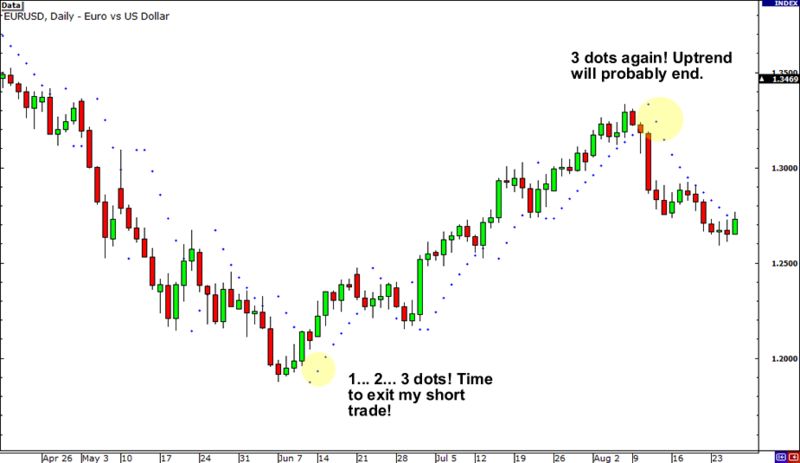 Other uses of the SAR, is to show us, when should we have to get out of our current trade. In the picture above, you bet If a sales position, then when the parabolic SAR led to three new point below, we recommend that you immediately close to the position and recorded a gain, because there most likely will turn bullish trend, so that your profit potential is lost. 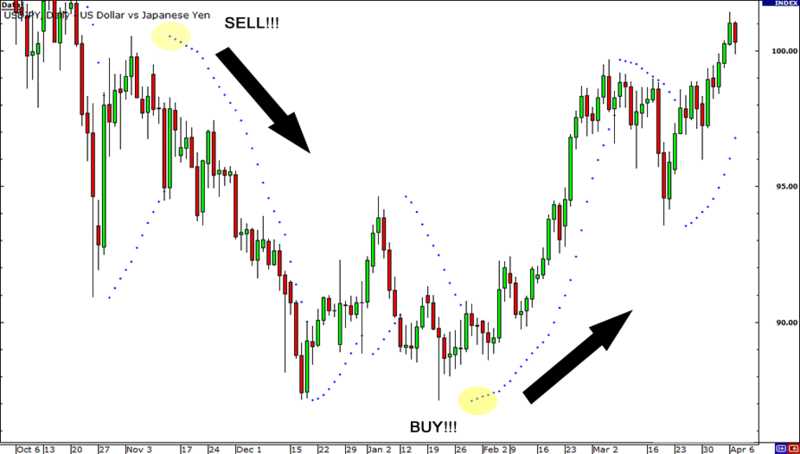 So if there are 3 new point of sale under the = trend is over, get ready for the trend to buy / bullish. Currently there are 3 points above = new purchasing trend ends, preparing sales trends / bearish. It can not be denied the SAR to help provide an easy point of view in determining the trend. However, the Parabolic SAR indicator is only accurate if a trend already established strong market. Under conditions where the price moves dramatically (volatile / Chopper) parabolic sar become less effective. Second in market conditions where the trend sideways (sideways), often creating SAR indicator (false signals) the wrong signal. * Parabolic SAR indicator is shown with a pattern of dots above and below the price. * parabolic SAR indicator effectively in a clear trend / strong or have been valid in the market, trending up or trending down. * On the trend sideways / sideways, or when prices move very volatile, less effective SAR indicator and possible raises false signals (false signals). * As there is generally no perfect in an indicator, combined with other indicators to improve the balance is a good alternative and can be exercised. I highly recommend run first in $50 no deposit bonus forex account to start this this parabolic sar strategy.